Entrepreneurship and innovation are at the core of Digital Business where we are constantly seeking inspirational ways to deliver high quality services to our customers. In keeping with our purpose: ‘getting the right information to the right people at the right time’ we strive for utmost excellence in our product and services offering. Our suite of services enables the consumer to foster continuous improvement and efficiency while keeping updated with technological advancements. Whether it be creating a mobile app for a tech fanatic or implementing a document management system for an organization, our services are of the highest quality and are result-driven. We are a leading management consulting & technology services company, committed to helping organizations innovate, share knowledge & improve performance. With our custom advanced Web Application Development solutions, we can assist both businesses and government deliver on their business strategies from start to end. Our approach to Document and Records Management is based on the idea that information changes value and is is transformed through five phases within an organization. Our SharePoint 2013 solutions help improve organizational effectiveness through comprehensive content management & information-sharing for better insight. 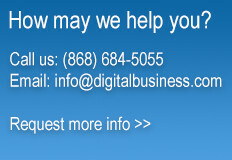 Digital Business is the Caribbean's mobile application development company. Having developed world class mobile apps such as the Digital Pan App, let's build yours today. We take innovation & business process a step further by offering Training & Development tailored to our clientele’s needs and to support our Products and Services.